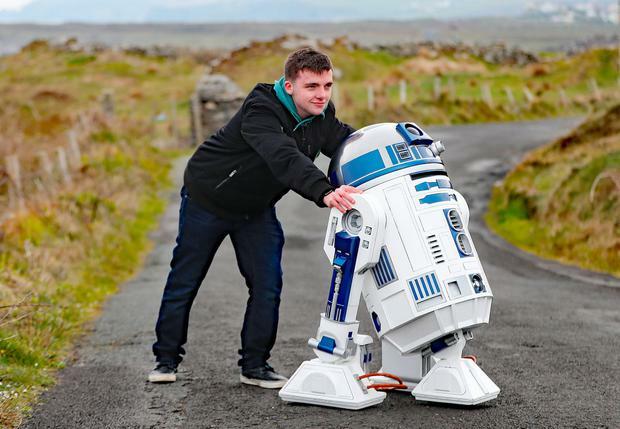 A road in Donegal has been renamed the R2D2 in tribute to one of the most famous characters in 'Star Wars'. New signs were unveiled on what was the R242 near Malin Head to mark where scenes from the most recent instalment of the saga, 'The Last Jedi', were filmed. A replica R2D2 droid joined other 'Star Wars' characters on the country's most northerly point to celebrate the novel tourism initiative. The name-change on a road that runs through the scenic Inishowen peninsula has been approved by Donegal County Council. It was initially agreed on a temporary basis but the switch is now set to become permanent. "Hopefully for a long time tourists will come and get their photo taken with the R2D2 sign and see the beautiful location where 'Star Wars' was filmed," he said. Education Minister Joe McHugh, a TD for Co Donegal, formally cut the ribbon at the ceremony.